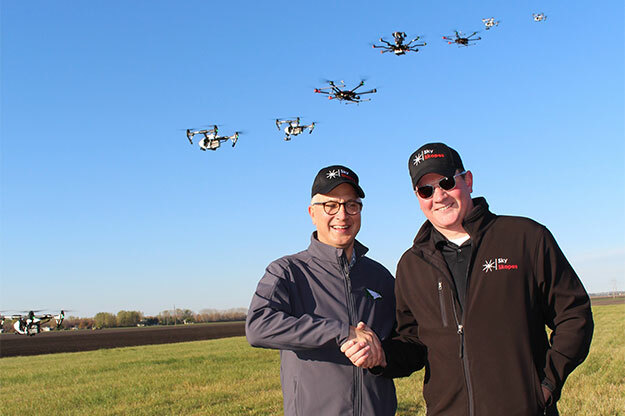 SkySkopes, led by UND alumnus Matt Dunlevy as president and CEO, is the first FAA approved and fully insured UAS business in North Dakota. It also got its start in UND’s Center for Innovation, which just received a large federal grant and state match to advance UAS industry development. Image courtesy of Matt Dunlevy. Amy Whitney had only just accepted her position as director at UND’s Center for Innovation before working on something big. Whitney and Della Kapocius, associate director, began collaborating long-distance as early as June to capitalize on a unique opportunity. Last week, they were proud to announce the University Center for Autonomous Systems Innovation, established through a $100,000 grant from the U.S. Department of Commerce’s Economic Development Administration (EDA). The grant covers the first year of a five-year program, with the potential to renew each year. This is a significant funding opportunity, says Whitney. The grant bolsters an already-growing UAS industry sector in North Dakota, giving UND more tools to make statewide economic impacts. UND was among 20 universities in 13 states selected by the EDA for the University Center funding. The storied program focuses efforts on assisting the implementation of regional economic development strategies and projects. Whitney, back in June, realized it was their time to act if they didn’t want to wait another five years for the opportunity. Autonomous systems commercialization became the focus of their grant-writing this past summer. 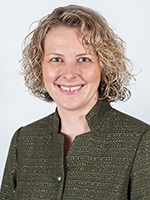 Whitney cited the Center’s strong foundation of autonomous systems in their entrepreneurial activity – a characteristic she quickly grasped as a finalist for the directorship. Now the University Center for Autonomous Systems Innovation can more effectively serve UAS commercialization efforts in the region. “This grant funding strengthens the Center’s ability to support the UAS industry. We can help North Dakota as a state to maintain its position of industry leadership,” Whitney said. The Center for Innovation was able to match the EDA with another $100,000 from the North Dakota Department of Commerce. In establishing the University Center, the Center for Innovation will be able to hire a staffer whose focus is solely the new program. Kapocius says their job will be to facilitate partnerships between the academic community and private sector as well as support new business development. “They’ll connect businesses and individuals who have a need or challenge with resources that can help them meet that need or develop answers,” she said. 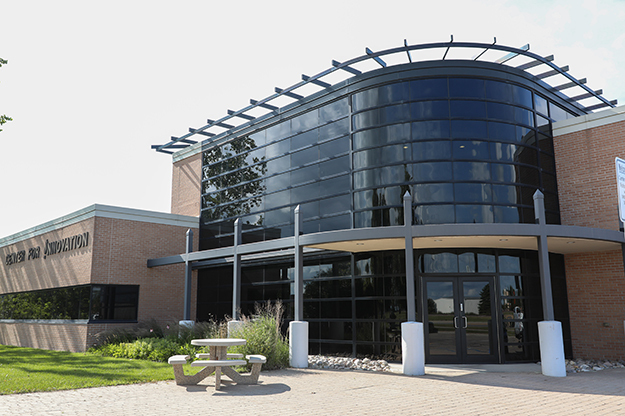 The two consulted with UND’s Research Institute of Autonomous Systems, as well as the local economic development corporation, to ensure collaboration in the event of receiving a grant. Whitney likened this new role to the glue connecting all operating parties within the UAS industry cluster – students, faculty, industry and the resources in between. Kapocius added that the new staffer will be responsible for pulling the right mix together so the University Center can provide high quality technical assistance, whether it’s starting a company or solving a research issue. “We haven’t settled on a name for those teams,” she said. “We’re leaving that to the new person,” Whitney responded with a laugh. The establishment of a University Center will allow the Center for Innovation to expand its services toward autonomous commercialization. Bringing on a new staff member dedicated to connecting resources will potentially create experiential learning opportunities for UND students as the Center works to meet private sector research needs. Archival image. What the Center for Innovation hopes to see is a general increase in UAS activity, but also work that fits the strategic goals of the University. When asked if students will get involved, Kapocius says there is a potential for experiential learning opportunities related to research and commercialization. It’s all just a matter of timing. UND Provost Tom DiLorenzo says the Center for Innovation has a long history of nurturing success, being a first home for a number of UAS startups. Now that is moving toward student involvement. UND President Mark Kennedy concurs, commending Whitney for her “outstanding leadership” and furthering UND as the chief opportunity engine for students and North Dakota’s economy. “This is a fantastic development for our students, the Center for Innovation and the University,” he said.